3 Areas of Your Water Heater to Check Before the Cold Season | Atlantic Refrigeration and Air Conditioning, Inc. The cold season is approaching. If you have an air conditioner, then you know it’s nearly time to be shutting it off and switching all power to your heater. However, that’s not the same story with your water heater. It has to work all-year-round, regardless of the season. Water heaters are often taken for granted because they perform quite well with little upkeep. 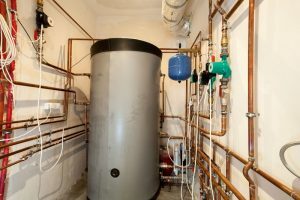 In truth, there are several working components in a water heater, and many homeowners might not know just how much goes into it. Do you know when the last time you changed your anode rod was? If you can’t remember, now might be a good time to inspect it. The anode rod is there to protect the inner lining of your water tank. It might surprise you to hear that the water in your tank is highly corrosive to the tank itself. When unprotected, the tank won’t last long. And while there is a lining of glass to help resist the corrosion, this glass can eventually break, too. That’s where the anode rod comes in. The anode rod attracts most of the corrosive elements to it, thus receiving most of the damage. Its destruction actually creates electrons in the tank, which helps prevent corrosion further. But the anode rod will only last about five years. After that point, your water heater will be highly susceptible to damage, so it’s important to have it checked annually. Just because you don’t have a tank doesn’t mean your water heater isn’t susceptible to the elements. Hard water can be an equally harmful substance, and it can interfere with the crucial heating elements in tankless water heaters. Hard water carries magnesium and calcium, which will eventually leave traces of limescale wherever it ends up. If you’ve ever seen the chalky white substance stuck to the ends of faucets, you know what limescale looks like. This substance can also get stuck to the heat exchange elements of your water heater, thus reducing your efficiency and the lifespan of the system. A professional can help you by performing a water heater flush, which will clear out all the buildup from the system. Your tank water heater is, well, a big tank that’s full of hot water. While tank water heaters are fine for the most part, there is the issue of what happens if there’s too much heat and pressure in the tank. This can lead to the tank bursting, and that can cause serious damage. Luckily, there are safety measures in place to prevent these kinds of things, such as the temperature and pressure valves. When the temperature and pressure get to dangerous levels, the valves release heat and water to help return the levels to normal. Sometimes when this happens it leads homeowners to believe that their tank is leaking, but it’s actually just discharge from the valves. It’s crucial to make sure these valves are in working order. Contact Atlantic Refrigeration & Air Conditioning, Inc. for a thorough maintenance check of your water heater.